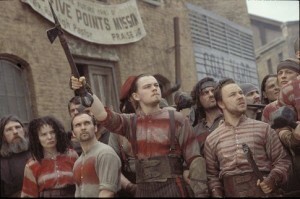 Gangs Of New York - Movie Review - Are You Screening? An artist stares longingly at a blank canvas. A parent stares lovingly at their newborn child. There is a difference between these two events, though they are extremely similar. In both cases, the mind is filled with infinite potential, the incredible power of the existence of something with limitless possibilities, and because nothing has happened yet, nothing has gone wrong. 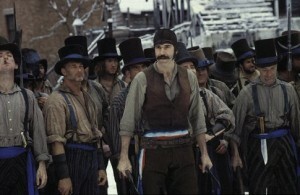 In bringing about Gangs of New York, Martin Scorsese is no longer artist, he’s parent. He got it in his craw to make a movie that would relate this part of history, or so the ending would have us believe, and it’s a sad fact, because I certainly don’t know anything more than I did going in. Of course, this isn’t really a movie about that portion of history (even Amistad trumps Gangs in ability to deliver useful information). No, it’s just a hopelessly trite and stupid story that happens to take place at a certain time, and it’s no more interesting at that time than it would be at any other. It’s a movie Scorsese was itching to make, and because he is Scorsese (and for absolutely no other reason) he got to make it. Gangs opens with a battle scene, but a battle scene like none you’ve ever seen before. Riddled with macho, ridiculous pomp and flourish, two gangs meet in the streets looking like footage lifted directly from Braveheart. The two sides collide in the most ludicrous ‘song and dance’ version of a battle since West Side Story, and you can’t help but expect that someone will start snapping their fingers, or mention ‘zip guns’. The hacking and slashing goes on until the villain, William Cutting (Daniel Day-Lewis), kills the… I don’t know, other villain? ‘Priest’ Vallon (Liam Neeson). At this point Cutting calls King’s X, and everyone stops fighting, apparently according to some ‘first General down loses’ clause. Vallon’s son, at this point a wee lad, manages to escape. We jump ahead sixteen years, and said son, who goes by the name Amsterdam (Leonardo DiCaprio) is leaving a youth correctional facility/home for children we don’t know what else to do with. Amsterdam isn’t back in New York long before another young lad recognizes him, telling him that he was there the day ‘Priest’ was killed, and even helped Amsterdam escape. This friend (who has a name, but who cares?) works for William Cutting (a k a Bill the Butcher), and manages to get Amsterdam into the Bill Cutting system, mainly because there aren’t many other ways to survive. Amsterdam obviously has thoughts of revenge, but there certainly seems no way to go about it. Now throw into the mix a downright silly plotline involving a girl named Jenny (Cameron Diaz), and the fact that at some point or other she goes to bed with everyone else mentioned in this paragraph, and despite the fact that the film is 166 minutes long, you already know everything that’s going to happen. Everything to do with the actual plot anyway. There are lots of things to do with the Civil War, draft riots, ‘Boss’ Tweed (Jim Broadbent), the plight of immigrants, and several other flights of pompous, bombastic fancy, but they are thrown at you at the sidelines of this utterly inappreciable story that avoids being screwball comedy, or made-for-television melodrama merely by the inclusion of a sack of meat cleavers. The worst part of the film is that it is so obvious that there is a brilliant filmmaker at the helm. The movie looks great. A few scenes here and there could have been excellent, if only they weren’t in the middle of this 16-year episode of Three’s Company. There are glaring editing problems, but generally, everything about the look and feel of the thing is of the highest caliber. The acting could have been equally great, and in some sense it is, but it’s very hard to take seriously. The buzz surrounded Daniel Day-Lewis like few actors in recent years when this movie came out, and he was certainly quite good. It doesn’t change the fact that he was a cartoon, and in several scenes actually looked like a spot in Who Framed Roger Rabbit?, but he was quite good. It had its good qualities, but anything good only made the thing more painful to sit through, not less. Making it to the end of the outrageously overlong film was indeed the most painful movie experience I can recall, and I’ve seen not only Ballistic: Ecks vs. Sever, but Swept Away as well. Worse yet, I’ve said that before, and can’t even recall the other film about which I used the phrase. Whatever it was, it just got somewhat better. While Amistad was also a poor movie, and was also about a period of history which wasn’t actually anywhere near as interesting as the filmmakers believed, at least you could watch it. It might have missed the mark in its ideas of the historical significance of the events in question, but it didn’t miss by miles. It didn’t try to make Romulus and Remus out of anybody. At the end of Amistad, you at least noted the historical facts. At the end of Gangs you care even less for knowing.